Tongue retainers with pink see through domes and pink bar. Pink tongue retainer with see through domes, these lay flatter against your tongue piercing than our other tongue retainers with balls, so there is even less chance of them being seen. 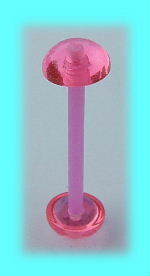 Both see through domes unscrew, and the bar is flexible pink acrylic. Pink Tongue retainers, see through domes. The best eCommerce software by ShopFactory powers P8681. All-in one eCommerce and shopping cart software.